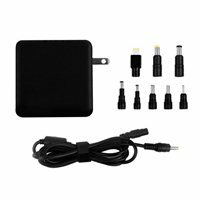 Alurateks Universal Power Adapter for Laptops / Chromebooks / Ultrabooks Station is the perfect solution to ensure that your personal laptop and USB powered devices are charged when you are on-the-go. The Universal Power Adapter for Laptops / Chromebooks / Ultrabooks Station plugs into any AC power outlet providing a reliable power source. The adapter is compact with foldable prongs making it ideal for business meetings, school, work office and on the road. It is well-suited for a variety of laptop brands including Lenovo, IBM, Samsung, Sony, HP, Dell, Acer etc and has built-in surge protection for safety.